As a side note, getting the new oven fitted revealed a couple of “quirks” about the electrics in the house, which may explain why the last one gave up after only 2 years… but that’s another story! The pies in question are from Higgidy. They’re really tasty, and (in my humble opinion) far better than the usual fare of pies to be found in the chilled aisles. If you’re interested, you can find your local stockist on their website: http://www.higgidy.co.uk/. 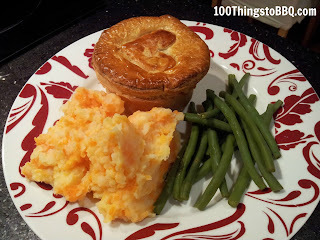 My favourite is the Beef, Ale and Stilton Pie – with the mash top. 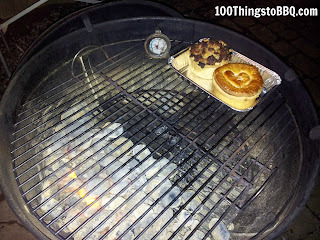 I set up the BBQ with all vents open, placing my thermometer on the opposite side to the coals, where the Pies eventually would be placed. The first reading was quite high at 250 degrees C, so I closed the top vents gradually and kept re-checking until the desired temperature was achieved. I’d recommend one of these stand thermometers to everyone – they've even useful for checking what temperature your oven is actually running at (when they’re working…!). 25 minutes later, out came two tasty pies heated all the way through… who needs an oven! I think the temperature was still quite high when I initially placed them in, because the mash topping was a little scorched, but it didn't spoil the flavour. Leave a comment below telling me what other unusual things you have cooked/heated on the BBQ. There is one type of BBQ food that always seems to cause debate about the best way to cook it. So far, I’ve not come across another cut of meat where opinions differ so greatly on how to get the best end result. I’m talking about ribs. 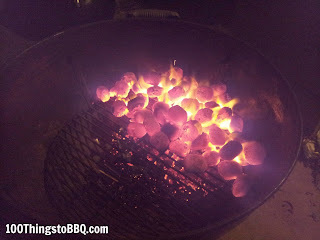 And whether you foil them or not, want a dry bark or saucy glaze, melt in your mouth meat or a little bite – there seems to be a multitude of different methods. And everyone thinks that their method is the best, and that every other method isn’t “Real BBQ”…! In a series of posts, I’m going to try a few different methods of cooking baby back ribs, and try to describe the different result each gives. The first method, and number 36 in the list of 100 things to BBQ is Quick Baby Back Ribs. I say “quick”, because some methods can take hours of slow smoking, whereas this method makes use of foil wrapping straight from the start, to speed up the cooking process. UK butchers, or at least the ones I have visited don’t seem to stock racks of ribs. They consider them an off-cut from the loin, and generally seem to be discarded or possibly sold individually and pre-glazed. I’ve actually had better luck finding them in supermarkets. If you can find them, “baby back” ribs may also be called pork loin ribs. Don’t buy the individual ribs that have already been cut, you’re looking for a whole rack. Regardless of method, the first step is always to remove the white membrane from the back of the rack. If left attached, this can be quite tough and it will stop any rubs, sauces or smoke from penetrating and flavouring the meat. To do this, start by gently feeding a small sharp knife under the membrane until you have enough to get a grip of. Then, gently pull the membrane back – it should come off neatly in one piece. When the membrane has been removed, you’re ready to apply the rub. I used a mix of paprika, garlic granules, thyme, sea salt and black pepper. Although I have since been advised that celery salt can be a tasty alternative to sea salt in a rub. Ensure the rub is evenly distributed over all of the ribs, including the sides and ends. Then, double wrap in some heavy foil. It’s important to get a good seal on the foil, because you don’t want any juices escaping from the parcel while the ribs are effectively being steam-baked. The secret of this recipe, and other foiling methods, is that by sealing the ribs in an airtight parcel, they cook quicker without drying out, which results in tender and juicy meat. 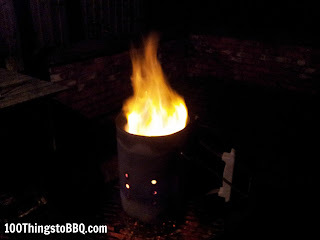 The ribs are then moved over direct medium heat where they will be left for about 1 hour and 15 minutes. To give you an idea of the heat level, I used two thirds of a chimney charcoal starter of briquettes spread out in a single layer and closed the top vent roughly half way. Cooking over direct heat really speeds the process up and is only possible because of the foil, otherwise the ribs would quickly dry up. I also flipped the ribs about 3 times during cooking. Be careful not to tear the foil when you flip the parcel. Flip the ribs every few minutes, and baste with some of your favourite BBQ sauce each time – being sure to replace the lid each time. After 10-15 minutes of repeatedly basting, you should be left with a much more appetising looking rack of glossy mahogany ribs. Yum! Remove from the grill, carve into single rib portions and serve immediately. When I first read about this method, I was sceptical. Having read about the “slow & low” methods, I thought these quick-cooked ribs were going to be tough and chewy. But they weren’t – the meat slid clean off the bone and melted in your mouth. They were probably lacking a little bit flavour wise, because most of the flavour came from the sauce and rub. But overall, I was really impressed. Have you tried this method? What’s your favourite way to cook ribs? Leave a comment below.